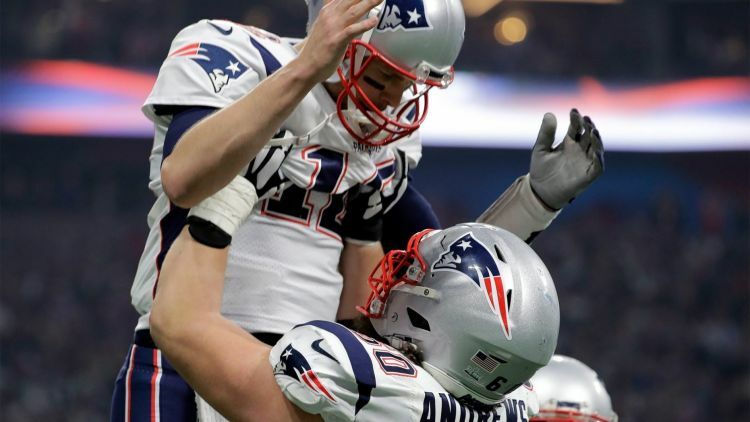 The New England Patriots broke one record and tied another by beating the Los Angeles Rams 13-3, to win the lowest-scoring Super Bowl in history, and match the Pittsburgh Steelers as the NFL's only six-time Lombardi Trophy winners. The matchup shattered the record of lowest-scoring Super Bowl to date: Super Bowl VII, when Miami Dolphins beat Washington Redskins by a score of 14–7 in January 1973. New England rookie running back Sony Michel scored on a 2-yard run with roughly 7 minutes remaining to give the Patriots a 10-3 lead over the Rams. Kicker Stephen Gostkowski later added a field goal late in the fourth quarter to close out the scoring. The first Super Bowl without a touchdown through three quarters was in dire need of a boost when quarterback Tom Brady completed four consecutive passes to set up Michel's touchdown plunge. The drive opened with an 18-yard catch by Rob Gronkowski, who added a 29-yard diving catch at the 2. The Rams answered the Patriots with a long field goal near the end of the third quarter to tie at 3-3. Greg Zuerlein connected on a 53-yard field goal with just over two minutes remaining in the third quarter to tie the game. The Patriots drew first blood on a 42-yard field goal early in the second quarter. The score, on a kick by Gostkowski, followed a defensive battle in the first quarter in which the Patriots' opening drive was short-circuited by a Brady interception and the Rams' inability to move the ball. Catch after catch in this one, Brady's favorite wide receiver helped make them winners again. Julian Edelman had 10 receptions for 141 yards and was selected as the Super Bowl MVP on Sunday night. Only Pittsburgh's 2-0 halftime lead over Minnesota in the 1975 Super Bowl — won by the Steelers, 16-6 had fewer points. The teams won their respective conference championship in overtime thrillers on Jan. 20 to make it to Atlanta's Mercedes-Benz Stadium for the NFL's 53rd Super Bowl. The Patriots beat the Kansas City Chiefs, 37-31; the Rams beat the New Orleans Saints, 26-23. New England entered the game a 2½-point favorite to win the franchise's sixth Super Bowl against three losses. A half-dozen Lombardi Awards tied New England with the Pittsburgh Steelers as the only six-time winners in the league's history. Brady at quarterback and Coach Bill Belichick prowling the sidelines in his trademark hoodie has been a wildly successful formula this century, but there are questions as to how long the 41-year-old field general can defy father time. The Rams, whose past two Super trips were representing St. Louis in 2000 and ‘02, had four players who have gotten this far. New England had four on its defensive line alone. The Rams (15-4) were back in the Super Bowl for the first time since meeting against the Patriots 17 years ago to the day — and for the first time as the “Los Angeles Rams” since 1980, when they fell to the Steelers. The Patriots (14-5) were back for the third straight time — they lost to Philly last year — the fourth in five seasons and the ninth since Belichick got the New England dynasty on track in the 2002 win over St. Louis. Brady was the oldest quarterback to start a Super Bowl. Goff is 24 and one of the youngest. Unlike Brady, who was a sixth-round pick in 2000, Goff was the No. 1 overall selection in 2016. Leading up to the draft, there were even comparisons of Goff to Brady for the youngster’s footwork, pocket presence and accuracy. Just three seasons in, Goff was in his first Super Bowl. Brady sees some of himself in Goff, and not just the fact that they were California kids who grew up in Bay Area cities — Brady in San Mateo, Goff in Novato — located less than 50 miles away. He knows Goff represents hope for a franchise on the upswing that yearns for success after several subpar seasons. Goff was only 7 when Brady started his history-making run. At 24 years and 112 days old, Goff was the fourth-youngest quarterback to start a Super Bowl game — and the first millennial. Brady is actually fifth on that list, at 24 years, 184 days old. The 17-year age gap was the largest between starting quarterbacks in Super Bowl history. Belichick, at 66, became the oldest coach to win a Super Bowl. He has worked 41 postseason games, with 30 victories, most among head coaches in NFL history. He had been the only head coach with five Super Bowl rings. Sean McVay is half his age and was in his first NFL title game, the youngest Super Bowl head man. Belichick has already coached in more Super Bowls than any other coach and already has more wins than any other coach. The Rams attempted to cap their remarkable two-year turnaround under McVay with their franchise’s first Super Bowl championship in 19 years, just three seasons after returning to L.A. from St. Louis. The Rams had been through 13 consecutive non-winning seasons and hadn’t won a playoff game in 12 years before they hired McVay, who was 30 at the time. The youngest head coach in modern NFL history immediately engineered a seven-game improvement last season. Sunday’s game between the Rams and Patriots marked the eighth rematch in Super Bowl history.